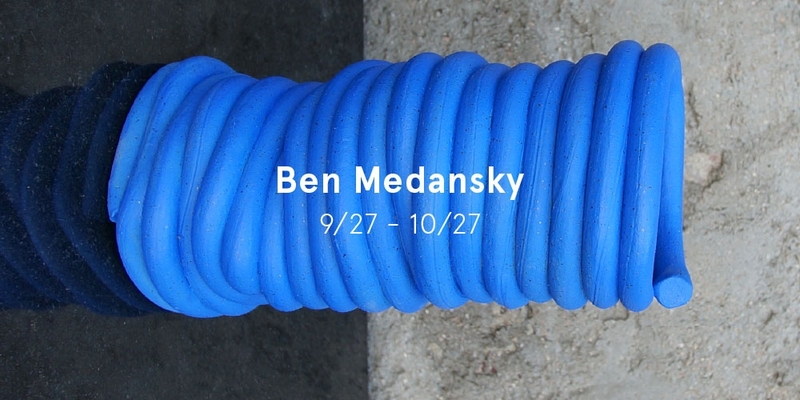 ODLCO presents the first solo exhibition of Los Angeles-based ceramicist Ben Medansky from September 26th through October 27th. Objects include table lamps, candlestick holders, cups, pedestal stands, and bundled sculptural objects, created from clay forms that are first extruded into cylindrical profiles. 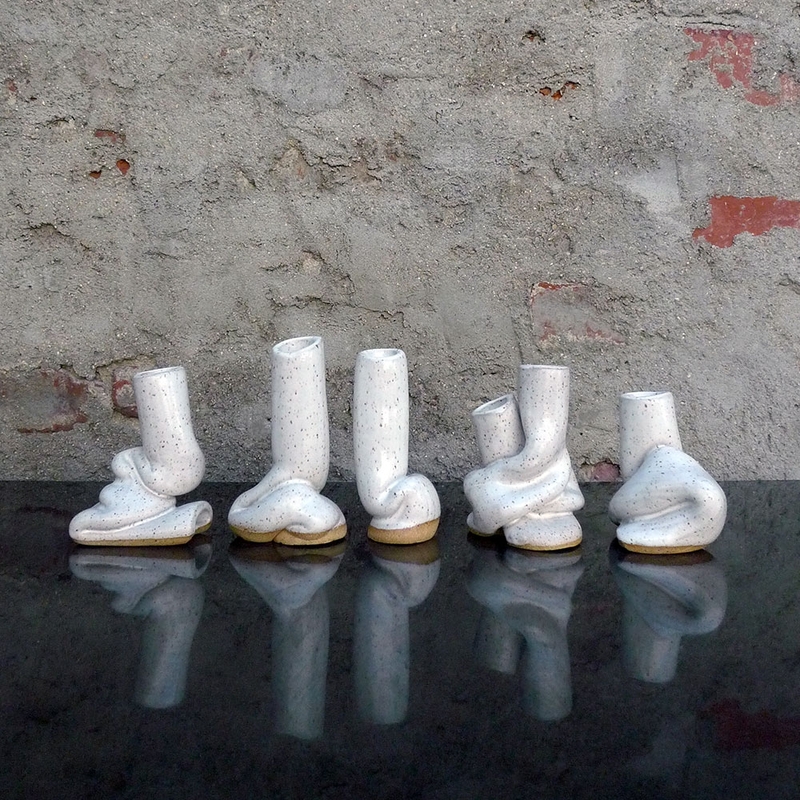 Each piece was shaped, glazed and fired by hand in Medansky’s workshop. All works will be on sale at ODLCO for the duration of the show. Read more about Ben and his studio at LA I’m Yours. We’ve known of Ben’s talents for a few years now and are excited to be able to show his work in Chicago! Join us for the opening reception on Thursday, September 26th from 5-8pm at the ODLCO storefront space in the West Loop (1136 W. Randolph St.). The show is curated by Marco Braunschweiler, former co-director of Golden Age, a sorely-missed project space that existed in Chicago from 2007-2011. Preview a few pieces in the photo gallery below. In his first solo exhibition, Ben Medansky is working backwards. Starting with the prototypical conversation of function inherent to ceramics, Medansky interrogates the topic by depressing it–both literally and conceptually. The objects in this exhibition are created using an extruder, an industrial machine that pushes malleable material through a die to create objects of a fixed, cross-sectional profile. 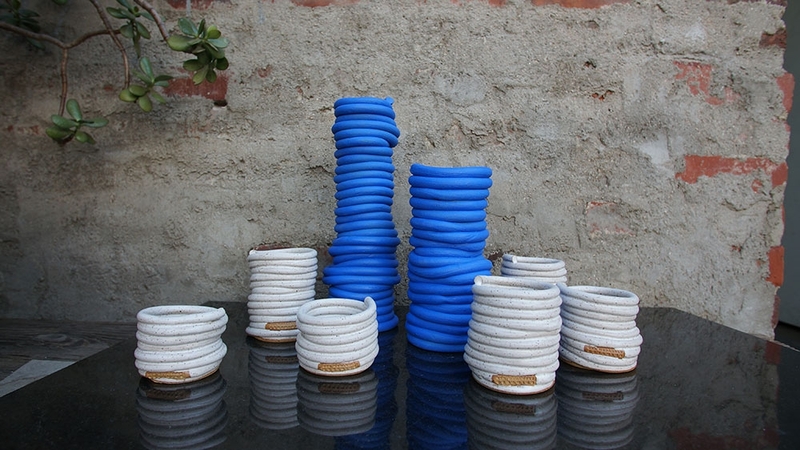 The resulting material–vastly different from a wheel-thrown form–is the base. This is sculpted into playful forms then skillfully glazed with zigs and zags. There's an effortless action in these works, highlighted by a serene and sometimes gestural finish. This presentation is a collection of anthropomorphic ceramics that are equal parts languid, ardent, ceremonious and delicate. Ben Medansky (b. Scottsdale, AZ) studied at The School of the Art Institute of Chicago where he focused on sculpture and design with an emphasis in ceramics. Medansky has worked with Los Angeles designer Kelly Lamb and artists Peter Shire, Anthony Pearson and Shio Kusaka. Medansky's work has been written about in New York Magazine, Sight Unseen and Refinery 29. Medansky lives and works in Los Angeles, CA. Marco Braunschweiler (b. Newport Beach, CA) is an artist and curator. He has lectured and presented programs at the Art Institute of Chicago, White Flag Projects (St. Louis) and the Museum of Contemporary Art Chicago, among others. Previously, he was Co-Director of Golden Age, an artist-run project space in Chicago, Illinois from 2007 - 2011. As an artist, Braunschweiler's works have been included in exhibitions at The Milwaukee International Dark Fair at the Swiss Institute (New York), The Green Gallery (Milwaukee), among others. Braunschweiler lives and works in Los Angeles, CA.